How can honey benefit me? Honey has been used for millennia not only as a rich source of natural sugars but also as a powerful healer. This page is designed to provide you with an informative and accurate understanding of the special benefits that honey brings to your diet. No free water: - Just like us, bacteria need water available to them to grow and function normally. The high concentration of sugar in honey traps all the water, leaving no free water available for anything else to use. In fact honey is hygroscopic; it can pull and trap moisture from the air. Honey has a long shelf life, typically 2 years. Excessive moisture can cause osmophilic yeasts to ferment honey. Keep honey stored in a dry place with the lid firmly in place. pH: - Honey's acidity (low pH) makes it a hostile environment for microorganisms to grow in. Peroxidase enzymes: - when bees ripen honey they add enzymes in the process. Peroxidase enzymes can become active when honey is diluted and their products (peroxides) are very effective at inhibiting the growth of microorganisms. See info on manuka below for more on "peroxidase and non-peroxidase activity"
The Plant - Hedera helix or common ivy is found in its native habitat throughout western Europe and as far east as Turkey. It has naturalised as a garden escape in Australia and the USA. The small green flowers open from September to November until the first hard frost. The flowers produce an abundance of nectar and pollen which is a critically important late food source for many species of insects. Historical Uses - Early medicinal texts have highlight Ivy's importance as a healer since the 10th Century. It found particular use in the reduction in swelling of the lungs, kidneys, spleen and liver as an anti-inflammatory. More recently, sheep and cattle farmers would feed ivy to "sick" animals. In fact sick animals would often choose to only eat ivy leaves. Nowadays, ivy is sold all over the world as a natural, safe and effective remedy for persistent cough. Ecological Value - Recent research carried out in the UK has shown the benefits of Ivy to honey bees was so high that the distance they have to travel to find food in September & October in shorter than in June & July. Research - There have been many scientific studies into the healing and curative benefits of ivy. These have mostly centred around the use of ivy as either an anti-inflammatory or to treat respiratory diseases. The latter has gained the most acceptance in modern medicine. The positive response from users of ivy products is due to compounds naturally present in the plant. Saponins - The plant saponins "Hederacoside-C" and "alpha-hederin" are believed responsible for this cough relieving efficacy. 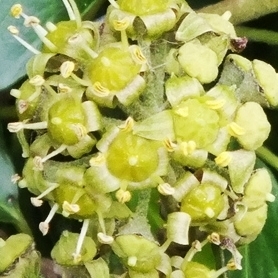 Importantly, new research into ivy honey has shown that the unique compound "Hederacoside C" is present in pure ivy honey from Ireland and the unique benefits of ivy honey are attributed to this. The Plant - Leptospermum scoparium or the manuka bush is native to Australasia. It has many small creamy white flowers which are attractive to bees. Manuka or Kanuka? - Have you ever heard of kanuka? I'd imagine most people haven't. Kunzea ericoides is also native to Australia and New Zealand, is very similar to manuka, in fact, it used to be called manuka and up until recently was in the genusLeptospermum. 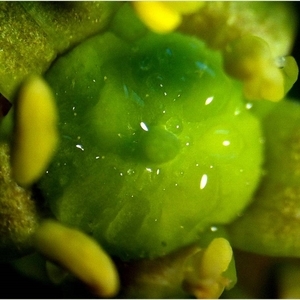 - The problem with kanuka is that its pollen is microscopically identical to manuka pollen. This makes it very hard to tell if manuka honey has been mixed with kanuka honey. And because it doesn't have the same properties as manuka, mixing can leave the consumer short changed. Melissopalynology - Typically if a mono-floral honey is labelled as such, it should have predominantly the pollen of that species. Melissopalynologists are experts at pollen identification which is still the best way of establishing a honeys floral source. NPA - Sometimes this is shown as a measure of the levels of "activity" in a manuka product, e.g., 10+, 20+. It stands for non-peroxidase activity. Manuka was found to be different to other honeys because it retains its antibacterial properties after the effects of peroxidise enzymes are removed. We don't recommend purchasing any product which states a PA level of activity or doesn't explicitly state how it rates the honey's activity using NPA. You might be surprised how many products don't! The standard test uses concentrations of phenol as a comparison. In other words a 10+ manuka should have the same antibacterial strength as a 10% solution of phenol. Methylglyoxal - At first researchers didn't know how manuka honey retained its antibacterial properties after the peroxidise enzyme was removed. After many tests scientists believe this is due to the molecule methylglyoxal or MGO. Medical Grade Manuka - Manuka has found some use as a medical grade honey for treatment in wound protection and healing (See below).